Some traditions begin on a whim, and yet in their simplicity, they become a profound bedrock of family celebrations, rich in meaning and steeped in value. And it’s not until we’re given a glimpse backward that we realize how they’ve imprinted faith on our hearts and grounded us in hope for the future. I remember it began early in our marriage, with a simple “baby’s first Christmas” ornament, hung on a short, barren tree, between a few golden baubles. Like most young couples starting out, we didn’t have an excess of anything. We lived in a tiny parsonage and had scarcely enough extra to decorate our first Christmas tree. By the time our first child came along, our tree still lacked ornaments, but our hopes and dreams for what we wanted for our children was never lacking. And more than anything else, we wanted them to know that God loved them and was always working good in their lives…even when good was hard to find. Even if they were naughty or nice. So without a lot of thought for what it would look like in the end, we began a simple family tradition of expecting, seeing and experiencing. All to create a moment of knowing and a lifetime of faith. We kept a running list of milestones for each of the children, and during the weeks leading up to Christmas, we selected a specific ornament as a memorial marker of God’s presence all year long. Most years it seemed the list required us to narrow the focus in order to choose just one. The more we expected God, the more we saw Him in each other’s lives. The more we saw Him, the more we experienced His unwavering love and protection over our days. The tradition of each child opening a single ornament to commemorate God working in their lives through the year became a treasured part of our Christmas celebration. The faith which grew from a tiny package revealed on Christmas Eve still marks the hearts of my children. It marks all of us. And when I hear them recount something that happened in their day with the acknowledgment of, “it was a God moment” I know the seed of faith has not only been planted, but it’s firmly rooted in their hearts. 29 years have passed since the first ornament was hung on that tiny, barren tree. It’s no surprise that in the raising of 3 children, our Christmas tree has also grown through the years. Now, boxes with each child’s name sit, filled with delicate, tissue-wrapped ornaments. Ornaments which tell a story and memorial markers that lay a timeline of living. Our tree decorating has become so much more than a sweet time of gathering and hanging pretty baubles on evergreen branches. It’s become a rich time of remembering. A time of counting and reliving memories. And a time of inviting God to weave the truth of his grace and mercy deeper into our souls. Not for just a day, but for an entire year. Each and every year. 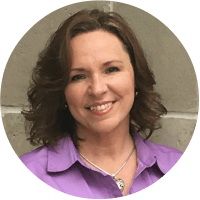 You can connect with Crystal through her Blog and also on Facebook , Twitter and Pinterest. I never expected it would become such a heart-warming tradition Kate, and it doesn’t matter how old the kids get, they love reliving the memories each year when they unwrap and remember the blessings tucked away. It’s become part of building a legacy of hope, and I’m so grateful we managed to be consistent! I hope they pass the tradition down to their own children one day. Interesting. Love your intention of helping your kids to see, experience and feel God. I’ve been wondering how can I do this as a mom. Well, I would encourage you to incorporate this into your family Melissa. It has taught us to look for and expect God 365 days out of the year. His faithfulness to show up is a huge faith-builder! Best to you as you consider how to tuck God into the seams of your children’s days. You are creating some special memories. That is such a great tradition. I LOVE the ornament idea! That is so sweet, special activity that I’m sure means a ton to them even now! My children thrive on traditions. I think we have a tradition for every Holiday. The tradition that I’m most proud of is our Postcard Book. Every time we visit somewhere new we grab a post card. It could be from a general store or a National park. We wright the date and who attended. It’s fun to get it out and look back as we put new ones in. Sometimes we don’t realize how long we’ve been carrying this tradition until we step back and look at the tree. Multiply this by the number of kiddos and well, let’s just say we never bought any other ornaments through the years except for these. What a great tradition! It makes Christmas even more meaningful. This verse from Hosea is such a sweet part of our tradition Elizabeth! To focus on the truth that God’s faithfulness to us is like the evergreen has been planted deeply through tangibly identifying how He was present each year in each child’s life. Of course, my husband and I got on board also, so we each have our own. Enjoy as you consider ways to keep remembering God’s faithfulness this Christmas. Crystal – you are right – we did this in the past and can get started back now that we have our first grandchild and 2 more on the way. I don’t know why we stopped – but our children always loved a new ornament each year. What a beautiful way to treasure family memories of God’s Presence in your lives! I love this idea. Our kids are grown, but it sounds like it would be fun even with the Grandchildren!